When I was a young girl, I loved Art class. That should come to no surprise being that I grew up to be an artist. History class, however, was another story! I certainly appreciated all of the great men of the past who've contributed to our society. But what about the women? Sure, we read about a few incredible women here and there every year. I remember because that's when my ears perked up in class! But, unfortunately, those moments were few and far between. I craved to hear more about great people with whom I could better relate, people who were once little girls like me. Judy Chicago, an American Feminist Artist, set out to teach both men and women about the achievements of women who've come before us, and to help us better understand the experiences women have had in history. Thank you, Judy Chicago! Judy Chicago is an American artist, author, feminist, and educator known for her collaborative installations which explore the role of women in history. Chicago's most well known masterpiece is a late 1970's collaborative, multimedia project called The Dinner Party, now part of the collection at the Brooklyn Museum. It is a symbolic history of women in Western Civilization. The piece is a large triangle with 39 place settings, each commemorating a historical or mythical female figure. Under the influence of Gerda Lerner, Chicago was convinced that women who are oblivious to and ignorant of women's history would continue to struggle independently and as a whole. Chicago's work can seen in Los Angeles County Museum of Art, The British Museum, Brooklyn Museum, Getty Trust, National Museum of Women in the Arts, and the San Francisco Museum of Modern Art. Hear Judy Chicago talk about her wonderful art piece The Dinner Party in this 2 minute video. Look up. Notice anything? Five LA artists hope you do. This Saturday, May 7, 2016, bird lovers will grab their binoculars and flock to LA for the second annual Bird LA Day! Angelenos might be surprised to learn that Los Angeles happens to be one of the best places in the country for birding (that is, bird-watching). But five LA artists have taken notice, and look to the sky for inspiration. These are our top 5 LA artists who love birds as much as you do. Elkpen hopes to draw attention to the birds and wildlife that are easily overlooked in our concrete-covered urban setting. Her encyclopedia-like style artwork has been attracting passersby to take notice of the underseen since 2006. “I wonder if being able to name something helps engender care for it,” said Elkpen. This Bird LA Day, Elkpen hopes her art will ignite conversation, and people will learn something unexpected about nature in the urban and suburban settings. Kendler aims to help people reconnect with the natural world through an activity birders will appreciate - birding! Her project One Hour of Birds asks participants to spend an hour watching birds through the lens of a camera, pressing the shutter button each time a bird is seen. They then send their photographs to Kendler, and she combines them to create a single image that serves as a record of that hour. Or stop by her solo exhibition Be Wilder on display at the San Luis Obispo Museum of Art (SLOMA) through May 30, 2016. More Information here. LA-based artist, Matt Adrian, pairs his gorgeous avian portraits with often suprisingly humorous titles. Matt hopes that by presenting birds in an unusual way, people will gain a a new perspective on birds. Figurative artist Anna Stump enjoys a fantastic front row seat to a wide variety of birds from both her LA and San Diego coast locations. Stump is interested in extinct and endangered birds. With her “Passenger Pigeon” series, Stump explored de-extinction – trying to make birds come back to life. Her stunning Passenger Pigeons series is based on the terrarium in the Museum of Natural History in New York City. Hattas painted this mural on canvas in her studio. She had the finished piece installed at the Isle a la Cache Museum..
LA public muralist, Jeanine Hattas works with public entities to tell stories that are important to the community. Her recent installation, “Passenger Pigeons over Voyageurs,” features the now-extinct pigeons that were once the most abundant birds in North America. Sadly, their numbers declined quickly after European settlement. By sharing the story of the pigeons in a public setting, Hattas, in collaboration with Isle a la Cache Museum Supervisor Chris Gutmann, hopes to impress upon visitors how crucial our role as human beings is on the environment. Watch a 2- minute time-lapse video of Jeanine painting and installing this mural. Art invites others to get to know us and our culture, and even help people understand themselves. Despite being told at a young age to devalue her culture, Angel De Cora used her art to promote it! Angel De Cora was born into the Thunderbird clan, and was granddaughter to the chief of the Winnebago tribe. A relative named her after opening the Bible and seeing the word “angel.” Her Winnebago tribal name was Hinook-Mahiwi-Kalinaka (Fleecy Cloud Floating in Space). At a young age, De Cora was kidnapped from her family in Nebraska. She was taken to the Hampton Normal and Agricultural Institute in Virginia, a boarding school created by the U.S. federal government with the goal of stripping Indian girls of their culture and teaching them to be good housewives. When she was returned to her mourning mother three years later, she found out her father, the old chief and his wife had died, and their old Indian life was over. Later, De Cora studied art at Smith College, Drexel Institute, and the Cowles Art School in Boston. She married William Henry “Lone Star” Dietz. Dietz and De Cora both taught art at the Carlisle Indian School in Pennsylvania. De Cora’s art had emotional depth. She painted warm childhood memories of life in Nebraska. She illustrated books, including two of her own stories for Harper’s New Monthly Magazine in 1899, both featuring Native American girl protagonists. De Cora and her husband’s illustrations can be seen In the 1911 “Yellow Star: A Story of East and West.” De Cora’s illustrations were unusual for the time because she drew Native Americans in contemporary clothing. Despite being kidnapped at a young age and being taught to devalue her culture, De Cora created thoughtful, humanizing images of Native Americans in her work, and promoted the value of Native American art and design. Before World War I, she was the most well-known Native American artist. DID YOU KNOW that Virginia Woolf’s sister was an artist? 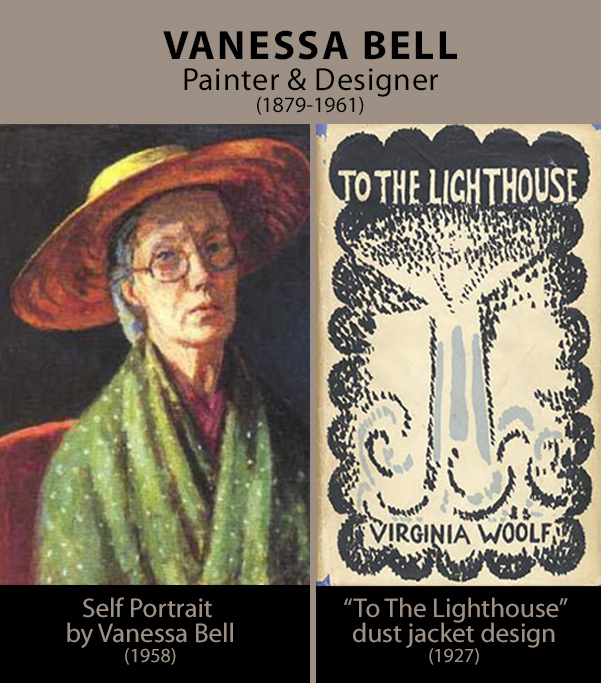 Vanessa Bell (1879-1961) was an English painter, interior designer, and a central figure of the Bloomsbury Group. She also designed the dust jacket for the first edition of her sister’s book To the Lighthouse. Talented family! I love to hear about other sisters who work well together. It’s great when my twin sister joins me on mural projects. She also designed this website! Can you think of other great sister teams? Self Portrait by Vanessa Bell, c. 1958. I love painting historial murals. And for this project, we even dressed the part! The mural stands at 16’ high, so museum visitors can get a full-size impression of miles of birds headed their way! If you were to take the same California Trail the pioneers followed in 1848, you’d find yourself at his museum, on I-80 in Elko, NV. Some buildings have more character than others!